Join us to celebrate 100 years of the Royal Air Force this Armed Forces Day and the official opening of our newly transformed Museum. Enjoy a family festival day of music, activities and talks! 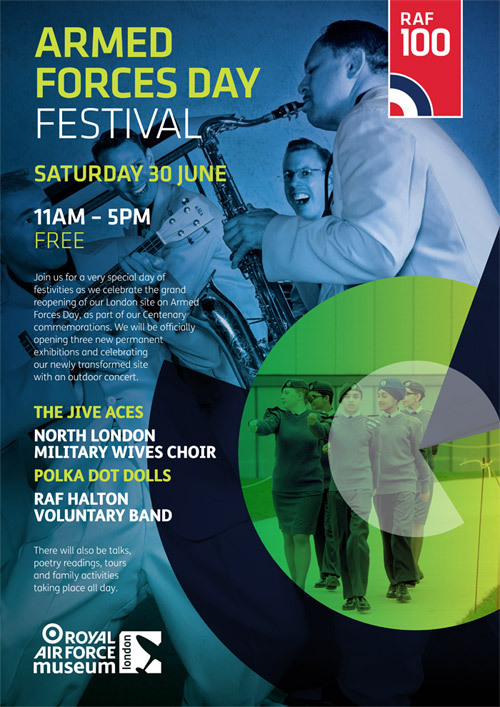 We will be celebrating with a star line up of music, featuring the Jive Aces, a six-piece high energy, jive and swing band, The Polka Dot Dolls, a vintage vocal harmony trio sure to get toes tapping and skirts swishing, the North London Military Wives Choir and the RAF Halton Voluntary Band.